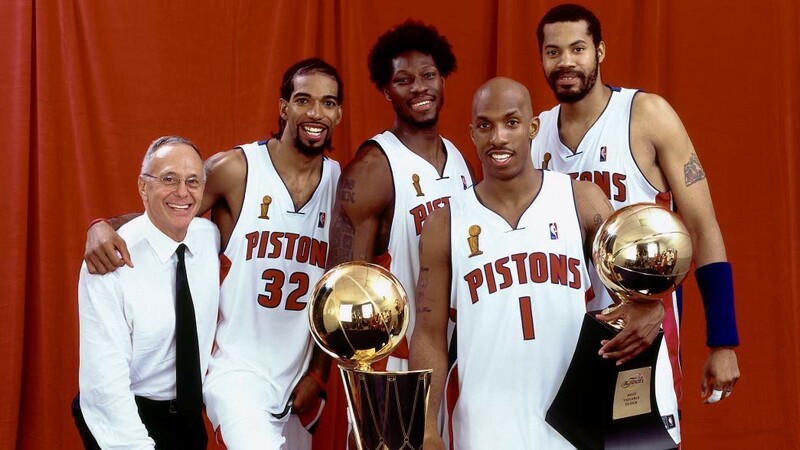 An article on the NBA website called it one of the greatest upsets in US pro sports history; the headline screamed ‘Pistons shock NBA world, win championship in 2004’. The Detroit Pistons beat the all-conquering Los Angeles Lakers, who were three-time reigning champions, coached by Phil Jackson and flush with superstars Kobe Bryant, Shaquille O’Neal, Karl Malone, and Gary Payton. “When I took over as president of the Pistons, there was a set way to do business, a set way of how you build teams in the NBA,” said Joe Dumars, a Hall of Famer who’d also won two titles as a player with Detroit. Instead of recruiting a superstar to carry the team, he wondered whether he could win with all-out team basketball — a philosophy that had been preached for some 50 years. Dumars continued, “People told me that you can’t do that in the NBA. I chose not to believe them”. When Dumars returned as team president in 2000, the Pistons hadn’t advanced beyond the first round of the playoffs since 1991, and had missed the playoffs in four of the previous eight seasons. It was a pure rebuild. “I was willing to think outside of the box,” he said of building his superstar-less team. I asked Dumars point blank what he was trying to achieve when he started building the team, and I found his response to be elegant and otherworldly. “Whenever I meet someone — it could be that I’m looking to recruit them for a job, or just a person I meet on the subway — I am always very interested in their journey,” he told me, “not so much where they are, but how they got there”. Dumars believes we get too caught up in a person’s job title, or their resume of accolades, neither of which paints an accurate picture of who they are going to be once they’re on the job. “Their journey gives you more insight as to who you’re really talking to,” he concluded. Case in point: Chauncey Billups, one of the stars of the 2004 team. Billups had been drafted 3rd overall in 1997, but was traded 4 times and played for 5 teams in his first 6 seasons in the league. “Here’s a guy who’s been through the worst of the worst,” Dumars said, “and at that time he was considered a bust; I could see he was ready to do whatever it took to turn his career around”. Ben Wallace was another. “It is a burning fire inside of him to this day that he went undrafted,” Joe shared. Billups and Wallace were quintessential to their team’s 2004 success, and both became perennial All Stars throughout the rest of their careers. The NBA world saw the Pistons as a team of unheralded has-beens, but Joe Dumars saw them as men with incredible journeys. Dumars, though, is quick to add that assembling the team is only half the challenge, and the belief you had in each individual during the recruitment phase needs to persevere. “You’ve got to let people know that you believe in them, and that you’ll never stop believing in them”. These types of affirmations take daily attention — something few leaders in the corporate world are willing to give up. Think about it: how often do we hire someone and then, after their Welcome Lunch, leave them to their own devices? “Every day you’ve got to show that guy that you believe in him. A nod, a smile, whatever,” Dumars says. As talent strategists and leaders, we need to rethink our lust for superstars and consider whether there are better ways to build our teams. Sometimes, a candidate’s improper journey makes them better suited for the hardships of your difficult projects. Sometimes, believing in someone who is unappreciated allows them to blossom into a world-class performer. Finding hidden gems and instilling belief in them takes daily cultivation, but it’s worth it. As a leader, you may get busy, but are you really too busy for a confidence-boosting nod?